Based on secondary research, survey results and participant observation, we determined the need for this student affiliate of the Be the Match National Foundation to increase its visibility among 800 other campus groups and encourage students to sign up for the National Bone Marrow registry. We recommended tactics including bone marrow typing drives with Hispanic and Asian student groups, hosting a film/Q&A event, improving social media posting, following, and sharing, garnering news coverage of events, crafting elevator speeches for volunteers, and unveiling #SwabRight on social media to increase name/purpose recognition and provide a fun and engaging way to interact with students. The campaign received an Honorable Mention on the NC PRSSA Inspire Awards. We started off with one month to create and pitch the idea for a campaign that would increase Nugget’s brand recognition. 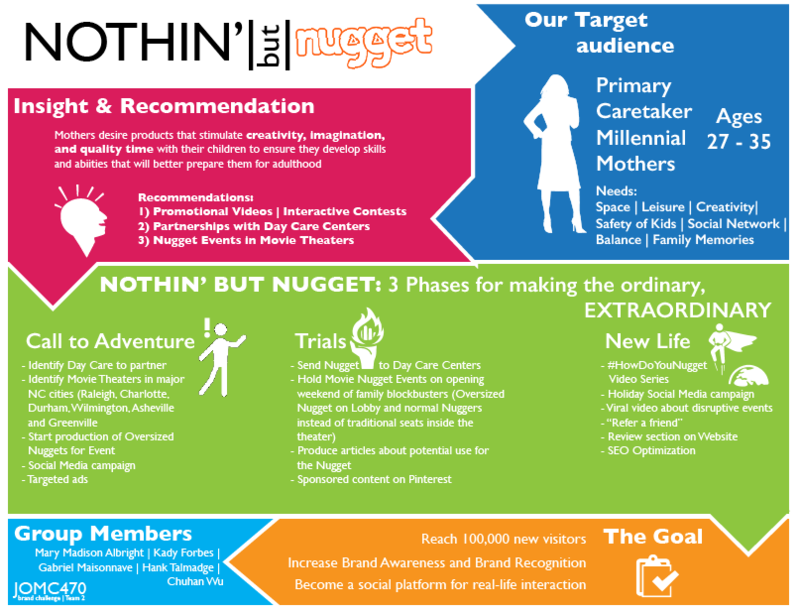 We conducted secondary research and came up with the campaign “Nothing but Nugget.” I designed the website where the campaign was hosted, developed the personas, performed the SWOT analysis, and came up with the Hero’s Journey strategy. We pitched the idea in front of a panel of marketing specialists. 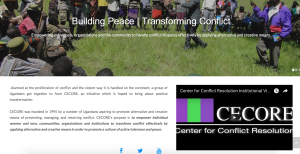 During five weeks at the Center for Conflict Resolution in Uganda I re-designed their website to improve user experience and availability of information. 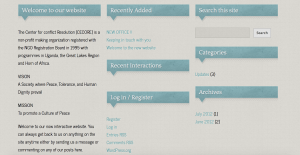 While the old website relied heavily on text, the new one uses video, pictures, infographics and copy to better express the intricacies of working with conflict resolution. Moreover I produced an institutional video and several testimonial videos to showcase the work they were doing.